Because of their beautiful song and bright gold coloration, goldfinches are often called wild or backyard canaries. Many homeowners seek to encourage them to frequent their property by providing birdbaths, feeders and nesting boxes. While goldfinches will not typically use nest boxes, you can lure them to your yard by providing them with food, water, nesting materials and trees in which they can build their nests. Goldfinches are melodious little finches, 7 to 9 inches in length, that consume the seeds of various weeds and plants. The males’ feathers are spectacular gold and jet-black during the breeding season; females and non-breeding males have duller plumage, better suited to camouflaging them among the trees. When molting, goldfinches become very patchy and look as though they have been attacked by a predator. Though males sing throughout the spring in order to attract mates, the nesting season for goldfinches does not begin until the summer. This coincides -- not coincidentally -- with the maturation of the seeds of many of their favorite food plants. Females use leaves and grasses to weave a cup-like nest that they place about 4 to 10 feet high in a tree, wedged between several vertical branches. They line the nest with milkweed and plant down for insulation. Goldfinches weave their nests so tightly that they will often hold water. It takes the female about a week to build the nest. Most birds that routinely use nest boxes are cavity nesters in the wild, so goldfinches are unlikely to use a nest box. Nevertheless, it does not hurt to offer a nesting box for the little birds, though it will likely be used by other species such as blue birds (Sialia sialis) or house wrens (Troglodytes aedon). As goldfinches are small, offer them small nesting boxes that measure 6 inches wide by 8 inches deep and 12 inches tall; the entrance should be a 1 1/2-inch hole. Platform nesting stations are unlikely to attract goldfinches either, but American robins (Turdus migratorius) or mourning doves (Zenaida macroura) may use these platforms. Though they are unlikely to use any nesting box that you provide, it's still possible to attract goldfinches to your yard. The easiest way to attract goldfinches is to feed them; goldfinches love Nyjer seed and will visit feeders stocked with it. It's also helpful to plant seed-bearing weeds and flowers that feed goldfinches; black oil sunflowers, dandelions and ragwort are excellent choices. Goldfinches are prodigious bathers, so including a bird bath or similar water source near the Nyjer seed feeder will increase your chances for success. By placing your feeders near some medium-sized trees, you will give them shelter from predators and a place to build their nests. Additionally, goldfinches will use fabrics and fibers that you provide to them for nest-building. By providing them with food, water, cover and nesting material the birds are more likely to inhabit your yard and even build a nest and raise a family. 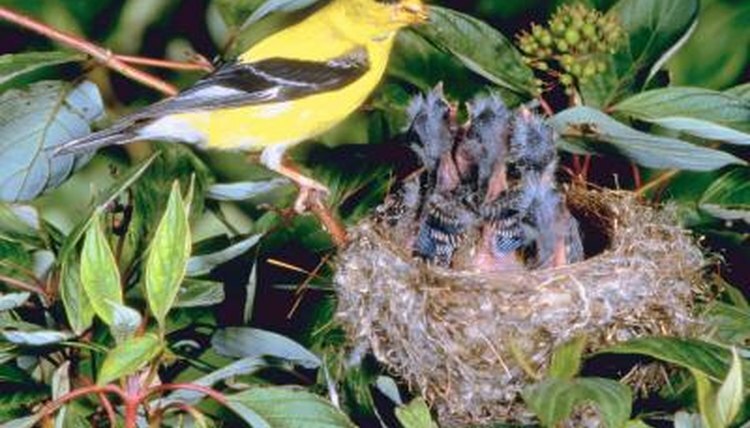 Wild Birds Unlimited: Why Do Goldfinches Nest so Late?